Things are happening very quickly now, so we've decided to create this top-of-page section to keep abreast of new information. We're relying on brodcast and newssite reports, first-hand reports from readers, the scanner, and Twitter. If you have any other sources of info, let us know and we'll use 'em! UPDATE 11:15: Chaney Trail: According to the Chaney Trail neighborhood newsgroup, firetrucks from locales as exotic as Napa and Calistoga as well as Los Angeles and the Forest Service have just headed up the trail. BTW, if you're in a fire-adjacent area, you may want to run your sprinklers to keep the area moist. I want to update you on the latest regarding evacuations in the Meadows. I understand that the sheriff's station told you that there were no voluntary evacuations in the Meadows, that is not correct. Two residence at the top of Risinghill were asked to evacuate last night. I drove up there myself and spoke with them. This afternoon a Sheriff's Deputy Sergeant with the LaCrescenta station came to my house and discussed with me their plan for this evening. One part of the plan was to ask residents to evacuate if they felt they needed to. Obviously they do not want to scare anyone, but living on Risinghill myself I can tell you that the fire is coming at us like a bat out of hell. The sheriff's are patrolling the area in the Meadows and one car is stationed at Lincoln and Canyon Crest in order to make sure that those who are looking for trouble do not make it up the hill, nor those who just want to get a closer look at the fire on the crest. My family are one house of about half of our street that are sticking around. For your information several homes and cars have been broken into over the past two days. We have been in touch with the majority of our neighbors updating them on information as we get and helping them get packed, or just reassuring them that we will be alright. I just want you to understand that this is a very serious situation but we have faith in our fire department to keep us up dated and safe. My wife and I will be here until my property starts to burn if that happens, so if you really want to know what is going on up here let me know. Thanks for getting the word out as it comes to you. 9:40pm Update: We live at Poppyfields/Santa Anita. Just went up to Alta Loma & Marengo. Lots of fire personnel up there but one of them told me ‘we’re just investigating’ - they don’t expect it to come closer down the hill overnight. Winds have died down. Fire is “stable”. So no evacuations probably below/ south of Loma Alta at this point. The fire does not at present pose a threat to JPL but as a precautionary measure, the Jet Propulsion Laboratory’s Oak Grove site has been closed. JPL will remain closed throughout the weekend except for essential personnel. Non-essential personnel will not be allowed on lab. Facilities at the nearby Woodbury complex, buildings 600, 601, 602 and 605 will remain open. Those wishing to learn the status of the Laboratory should call (800)303-4575 or (818) 354-8601 where State of the Lab updates will be posted. Updates will also be delivered to JPL personnel via JPL email; through the State of the Lab call in numbers; the Emergency Communication System, and postings on the jpl home page at jpl.nasa.gov. Also, just checked with the Altadena Sheriff's station about a rumor of evacuation: nobody is being told to evacuate (even voluntarily) at this time. However, people in the neighborhoods on the edge of the fire are being told to be ready to move, and if they're really uncomfortable, to just go ahead and find another place to stay. At this point (8:40 PM) nobody is being ordered to evacuate, either voluntarily or forcibly. With the fire has come an increase in curious persons and cars here in The Meadows creating safety concerns. In addition, a Canyon Crest neighbor's car tires were slashed last night.Altadena Sheriffs will increase their presence in The Meadows this evening including a watch at Lincoln and Canyon Crest to help identify residents as legitimately having access to The Meadows. Please be sure to have you I.D. with you should you need it. Also, if you see suspicious activity, please do not hesitate to contact the Altadena Sherriff at 626-798-1131. And for fellow scanner geeks, one of our readers says that Station fire air-to-air freq is 169.2875. Might be over with for the night, but should prove exciting tomorrow as the choppers and planes rev up. Of course, this is just eye-balling it from the ground here, but I have attached a map of the most likely path of the fire to Mt. Wilson. Being familiar with the terrain, I would say that the fire is certainly in Bear Canyon, but it would have to make its way up to Markham Saddle, then across upper Eaton Canyon to get to Mt. Wilson. Burn area in red (?) and likely path in yellow. Point of fact: I am a hiker, mountain history buff and donkey packer, but I am not a firefighter; this just a guess. By the way, the last time that area burned was the 1954 Woodwardia fire that took out Will Thrall's cabin, so there is a lot of fuel in Bear Canyon. We have been helping to evacuate animals (including a bob cat and an alpaca!) and we will take care of the pets of fire evacuees for free, for as long as they need to stay. I hope you can help by making a donation today. STATION FIRE is currently making runs towards Mount Wilson, which is a major communications facility servicing all of Southern California. Judging by the view from Mt. Wilson's cam, the fire has quite a ways to travel before it hits Mt. Wilson. Update 4:30: Bill Westphal emails us: " The Altadena WeatherCam has been turned due North for a better view of the East Flank of the Station Fire. As of 4pm, the fire has reached Brown Mountain just above Millard Canyon." Greg Sweet emails us: "I talked to Lonnie, the campground host at Millard Canyon about an hour ago (2:30pm 08/28/09). He had spoken with Wally at Search & Rescue and with Kevin Hunt, forest ranger. At that time there were no evacuation orders for Millard Canyon, but that he expected them soon; these things having to be drawn up by lawyers. However, he was wise enough to have already removed the pickup truck, computer, papers etc, and was considering the removal of his home/RV. Other cabin owners seemed to him to be less responsive to the threat. As of the time of our conversation, the fire had already burned through the Ken Burton trail and was advancing on the Brown Mountain road. Bug lovers rest assured, the bee keeper removed his hive two weeks ago. The word that the Burton trail had burned tells me that it probably went through Oakwilde Campground as well. But since that facility was slated for rehabilitation anyway, and the access road down Dark Canyon had long since overgrown, this may be a silver lining. "Resources" were scheduled to attack the fire from Chaney Trail/Brown Mountain this evening. Also, I witnessed a steady stream of panicked La Vina residents headed home mid-afternoon. Nuccio's had the Rainbirds on and looked a little worried. 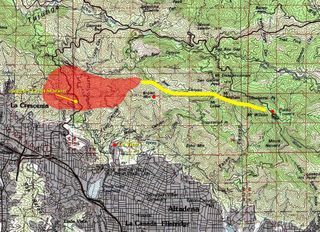 Please remember that as of 5 PM, nobody has been evacuated from Altadena, but several neighborhoods in the northwest (Millard Canyon, La Vina and The Meadows) have been/are being warned to prepare to move.